Tell Me When It's Over is an interview series in which we ask former athletes about the moment they knew their playing days were over. Today: Luke Witte, Ohio State center and on-court stomping victim. In March of 1971, Witte, listed at seven feet, put back a teammate's missed shot against previously unbeaten Marquette to send the Buckeyes to that year's Elite Eight. 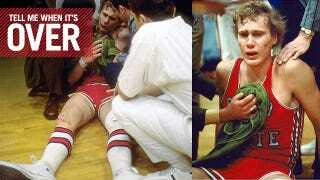 The following January, in a Big Ten game against Minnesota, Witte, after being fouled hard on a drive, was kneed in the groin by Corky Taylor, then, at the center of college basketball's most despicable brawl, stomped in the head, repeatedly, by future NBA player Ron Behagen (Behagen was recently found guilty of stealing more than $7,000 from an Alzheimer's patient). Though Witte was later a fourth round draft pick by the Cavaliers, his career was never quite the same. After three seasons of play in the NBA and a year overseas, Witte returned to Ohio and owned and operated a pair of sporting-goods stores before entering the seminary. He now lives in North Carolina, where he supervises workplace and corporate chaplains. Somebody asked me not too long ago: Did you ever win a game on a last second shot? And I remember one game against Purdue. We were playing at home and it was a foul shot that was missed by our team. One of our players was shooting a foul shot, missed, and I tipped it back in. And we won the game on kind of a last-second shot. That was the only last-second shot, so I don't think the Marquette shot was a last-second shot. It may have been a game-winner, but I don't recall it at all [laughs]. It's funny. I seem to remember games that we lost more than we won. There was a game against Michigan State where their uniforms were stolen and they had to wear our away uniforms, and so it was Ohio State versus Ohio State. That was my sophomore year of college. And we lost that game. It was the only game we lost in the Big Ten that year. It was just a weird setting. I obviously do remember the Marquette game. Jim Chones was their center and I went on to play with him for a few years with Cleveland. But I remember the Western Kentucky game probably a little more, and that was a game we lost and so... [laughs] I suppose if we had lost a lot of games I wouldn't be able to remember a lot of them, but we didn't lose of games so I guess those stand out in my mind more. And not as regrets. Not as regrets, either. It's probably because there were a lot less of those than the wins in my college career. I don't watch a lot of basketball now. I basically will thumb through the sports page in the morning because I'm expected to know when I go out on the streets, Did Ohio State beat Northwestern last night? That kind of stuff [laughs]. And, What did you think of the game? And I say, Well, I just didn't have time to watch it. I just follow it, cursory following at best. Sports in itself has not been a significant thing that I dwell on very much at all. I felt more comfortable with a ball in my hand than without the ball in my hand. That's metaphorically, obviously. Basketball was something that was always really an important part of my life. My brothers played basketball, so I was the little one on the court. They're both older than I am. They kind of picked on me and abused me out there in the driveway, so to speak, but I didn't know I was going to be six-eleven. It was something that I watched them do and had a passion for and I wanted to compete against them. And it was something I grew into. I got better and better and better with it, and really enjoyed the playing. I enjoyed the practice. I enjoyed the training. You know, every aspect of it, I really did enjoy. Last time I was measured I was a sophomore in high school and I was six-eleven and three-eighths, and I was never measured after that. So, was it meant to be? I mean, if I had the same desires and passion and I was five-five, you know [laughs], I probably wouldn't have said it was meant to be, but being the size I am and having the opportunity to go to school and to participate at that level and also to play at a professional level, there's not too many people that can say that and I do appreciate it. It was such a great experience. Even the downsides. I mean, we talked about losing games. I think we definitely learn more from our casualties of life, the challenges, than we do from the high notes. Walking away from something where you really, truly learn about yourself and your own character and how to respond to people, how to just be a man, about how you're taking defeat or challenges that come before you, I mean, that's huge. I don't think I've sat down and tried to unpack that by any means, but I think that does, at least as I'm thinking through this a little bit further, it does make much more sense to me. What happened was that last year I was with Cleveland and I'd been injured. I lost about eight inches off my jump because of a pretty bad ankle injury. And you know what? I just saw the writing on the wall. I'm already the tenth, eleventh, twelfth man on the bench. At that time we had Jim Chones and we had Nate Thurmond at center, and even though Nate was going to retire in the next couple years, I just had lost so much mobility that the writing was on the wall. So I knew that my professional career, at least in the NBA, was over and I just tried to eke out another couple seasons overseas. And, I did that. I think we had some pretty good times over there playing, but my body was just really not responding well to participating every day, especially the jumping. So it was a choice, a decision that I made. I wanted to play as much and as long as I could, and an opportunity to be overseas was huge. And I've always enjoyed traveling so it was not a hard move for me for me at all, especially with the injury that I had. I had been injured my third year with Cleveland, sometime in January, February of that year, and with the injury going through the summer. I tried to rehab. I went out and played in the summer league out in L.A. and then came back to Cleveland, and kept trying to get back at it. And I felt like I was getting pretty close to rehabbing, and then I broke my other foot. Probably because I was putting so much stress on my other foot that it just gave out. I broke the metatarsal and so there was kind of the one-two punch. I was rehabilitating that whole next season, and then I wanted to play during the summer, so I did the American touring team in Italy. It was kind of more barnstorming than anything. We played against the Yugoslavian national team, and during that summer I realized, You know what? It's not coming back. I mean, I'm feeling okay. You know, I'm able to cut. I'm able to turn. I'm able to do the things I want to physically, but it's like, you're standing in the middle and a guy comes down the lane and you go, I should be one step over [laughs], and I'm not there because I'm already late. I go up for a rebound and I realize all the hands are above mine rather than my hands being above theirs. These were good players. Not the best in the world. But they were good players and I'm just kind of being average in the good players. So how am I going to go back to the best in the world and even hope to be a good player? Or hope to be an average player in the best-in-the-world players? So that was the challenge. And so when I came back that summer I realized, I need to go in and talk to Bill Fitch who was our coach at Cleveland then, and say, You know, I'm just not— It's not happening. There was pain. And stiffness. I feel better today getting out of bed than I did that last year, and I'm 61, so it's a big difference. I wanted to eke out another year of playing, but I will have to say a lot of that had to do with living in Europe. I mean, we just loved the culture, and Donita and I talk frequently about getting up in the morning and going down to the little pastry shop and grabbing some coffee. I mean, it was just great. Heck, you only play one game a week [laughs]. My wife and I were married in '77. That year I was playing overseas, so I came home and we got married and then I brought her back to Europe with me and I finished out my basketball career in Switzerland. And then we came back. It was kind of like, Okay, what do we do now? I had purchased a farm a couple years before that, a small farm. I always tease that the only people that thought I was a farmer were me and the IRS, but we always raised a couple head of cattle and we had horses and chickens and plenty of cats and dogs running around the place. A great place to start a family. But we were just trying to figure out, What do we want to do with our lives? We're back here, and there was a strong desire to stay in the sports arena at that particular time, and so we had two sporting-goods stores. We started one in Alliance, Ohio, which is near my hometown, and then we had one up in Akron. And then after five years and the kids started coming along we realized that it needed both of us, both Donita and I, to make that thing run, and she was with the kids and we got to the point where we needed to make some changes. So I went to work for a bank in Ohio, Society Bank, and worked there until we went to seminary. The way my contract was with the NBA, I got another year paid. And even though the salaries were not anywhere near what they are now—in fact, they're minuscule; they're probably just one paycheck for today's athlete, what I got for the whole year—but we had some tucked away, and it was like, Okay, life is an adventure. We've always loved to travel and so let's see what's out there and let's see what we're good at. We've got the farm and we're just kind of seeing what life is all about. I would say there was not a fear factor at any point in time, like, Oh my gosh, what are we going to do? We've got to find work. And I looked around to see, Okay, what am I trained in? I have a degree in journalism. And I just loved writing. I loved those doing those kinds of things. But that's a hard way to make a living. It's a hard way to break in, and so what are some other things out there? Well, let's use our name. I think Donita and I also thought we had good business sense and how to make a living with the sporting-goods store. And I think we did pretty well with it, for being two young kids and just starting off. And the name helped. I was able to get my foot into doors where I wouldn't if I was Joe Blow, so it was a good transition for us. Donita's a very athletic girl. She has a master's in sports administration and so this was something that was right up our alley. The reality is that I knew I was supposed to be in seminary. Let me put it differently. I knew that I was called to ministry. It took me a while to say yes to that. It took me a while to go, Okay, it's time to sell the farm and to kind of recoup where we are in our lives and and move into a ministry setting. It was hard making that decision, and Donita and I wanted to make sure we were on the same page with that. She needed to be where I was at with that decision and it was hard for her. She was raised as a Catholic girl. I mean, she has no idea what a pastor's wife looks like, other than Tammy Faye Bakker crying and having mascara run down her face. So it was a challenge to get to that point, and they were all little steps. We really tried a lot of different things. One of the thoughts was, I've got a story. I can go out and do the speaking tour and, and do that kind of thing, but I kept going back to, you know, I've done that for a lot of years. I've already been on the speaking tour, and I don't want to be a guy that has a one-sermon repertoire. That doesn't do anyone any good. I need to feel like I'm much better educated than just being a one-pony show, so to speak. And so I was struggling with that. I wanted to be deeper in my faith. I wanted to be deeper in my knowledge, my understanding, and to do that, you do have to kind of pack up and go to seminary. Today, many, many of the seminaries have weekend classes and they're providing for people to still stay in their workplace setting and earn a living and then go to seminary on the weekends. That wasn't available. But I really didn't want to do that. I wanted to immerse myself in school and, go at it tooth and nail, which I am so glad I did, because that was a very positive three years for me and our family. We hunkered down, cut back our expenses, and we were able to financially not have any issues as we went through school. And it was just fun. We enjoyed that environment immensely. As late as this past week, somebody that I had known for a little bit didn't know, really, anything about me and just decided to Google me and that brawl came up and they just went, Oh my gosh. They called me into their office: You know, I just Googled you, and this was absolutely a surprise to me. So it's not something I wear on my sleeve by any means, but through that you have this tremendous opportunity, this person calling you into their office with, How can you forgive in that kind of setting? And being able to walk through with people: What is forgiveness all about? Because we all struggle with, you know, the neighbor who has his dog barking all the time. There's always these things that are going to bother and bug you, and they can be as minor as a barking dog or as horrific as being on the other end of a confrontation like the Minnesota thing. So I have to say, I don't get tired of people asking me about it because it's an opportunity. And it's funny. There was an article in the Charlotte paper and somebody was complaining that they were short and they were asked how tall they were, and they said, You know, you wouldn't ask a person how heavy they are or how fat they are or all these other questions. And this person was really ticked off about people asking all the questions, but my answer to that is, you know, you're made by God. You're a gift from God, and who you are and your stature is all a part of that, and if you hang around with me in public for five minutes that question's going to come up. How tall are you? Or it can be obnoxious kind of statements, but I've never been offended by that. It's just something that doesn't bother me. It's just like the Minnesota thing. It's an opportunity to be a reflection of what God has done in my life. And I always take it like that. We can look at it as a horrific thing, and people can be aghast looking at that video and going, How can you do that kind of thing? And I say, How can I not do that? Because it has given me an opportunity. It's given me a great platform. And so, it's one of those, what maybe man meant for evil, God meant for good. It's a Genesis 50:20 kind of thing. And I'm okay with it.